But with so much to do, will the holidays go according to plan? Do-It-Now-Daniel is having trouble practicing, Helpful-Holly can't stop worrying about making presents for her friends, and Humphrey still has to find a gift for Og! 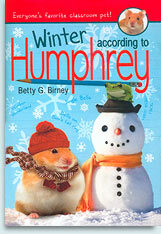 Good thing Humphrey is one smart hamster who can help them all fill the season with JOY-JOY-JOY!